A Superior Court judge last week lopped a limb off Proposition 98. Fans of Monty Python might have been amused; school districts will not be. The three-paragraph ruling by San Francisco Superior Court Judge Harold Kahn simply reaffirmed a tentative ruling he issued in March. Back then he ruled that nothing prevents the governor and Legislature from shifting money out of the General Fund, even if that in turn leads to less funding for K-12 schools and community colleges under Proposition 98, the law setting minimum funding for schools. The loss is significant. As part of the 2011-12 state budget, Gov. Jerry Brown transferred about $5 billion in sales tax and vehicle license fee revenues to a special fund as part of his shifting of state safety and social services to counties and cities. Had the money stayed in the General Fund, roughly 40 percent, or $2.1 billion, would have gone to the Proposition 98 guarantee. The California School Boards Association, the Association of California School Administrators, and three school districts sued, claiming that was an illegal diversion of money owed schools. Their attorneys argued that voters passed Proposition 98 in 1988 to prevent manipulation of minimum dollars owed schools. Legislators could suspend the minimum obligation with a two-thirds vote, while acknowledging that the money owed had to be restored over time. They didn’t do this. Or, if they still wanted to set up a special fund outside of the General Fund, they could pay a higher percentage to schools of a diminished General Fund. Lawmakers didn’t do this either. Kahn didn’t put enough in writing to fathom his thinking, but during oral arguments in March he implied that if drafters of Prop 98 had wanted to prevent the siphoning of money through special funds, they would have put it into the initiative. Lawyers for the plaintiffs argued that the intent of voters was clear: a minimum funding level that shouldn’t be tampered with. 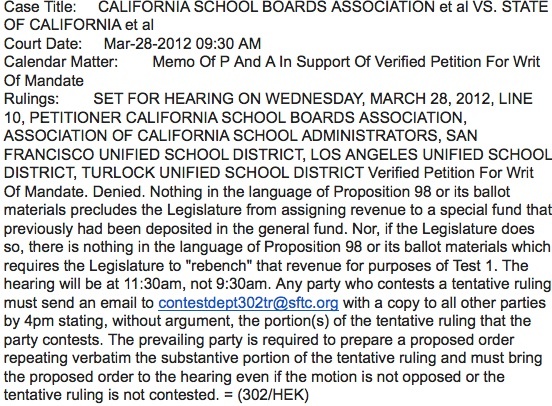 ACSA and the CSBA haven’t decided whether to appeal Kahn’s ruling. Superior Court decisions are not cited by other courts as precedent-setting decisions, so there’s always a gamble going to the Court of Appeals. Meanwhile, Brown plans further tampering with Prop 98 if his tax initiative fails in November. He is proposing to stuff $2.6 billion in school construction bond payments, which had been funded as part of the non-Prop-98 part of the General Fund, into Prop 98. In effect, that would create a cut in funding for schools. Though the circumstances are different, Kahn’s ruling will encourage these types of manipulations. Also in Tuesday’s primary, voters in 23 K-12 districts passed nearly $2 billion worth of school construction bonds, a strong commitment in uncertain times. A piece of that money in some districts will go toward upgrading technology, critical as districts move toward implementing Common Core standards with digital textbooks and computer-administered assessments. Bond measures in an additional 11 districts were rejected, although a few came tantalizingly close to the 55 percent needed for approving school bonds. For 2012, 13 of 18 parcel taxes have passed; that’s 72 percent, which is higher than the historical passage rate of 58 percent. Among the losers on Tuesday were a $54, four-year parcel tax in Santa Barbara, which would have replaced a $50 tax due to expire next year, and a parcel tax in West Contra Costa Unified based on a home’s size – 10.2 cents per square foot. But voters there can get another chance, if the school board is inclined, since the existing 7.2 cents per square foot won’t expire for two years. Parcel taxes are one of the few ways that school districts can raise money. They’re predominately found in high-cost Northern California, especially the half-dozen counties in the Bay Area, with a smattering in wealthy districts around Los Angeles. Most parcel taxes are under $100, especially initial parcel taxes. The exceptions on Tuesday were an eight-year, $458 tax in Ross Valley School District in Marin County, replacing a $309 parcel tax, and a $123, eight-year tax for elementary and high schools in Santa Cruz; it passed with more than 80 percent of the vote. Because of the passage of Proposition 13, parcel taxes cannot be based on a property’s value. Because McMansions, cottages, and office buildings are all charged the same, parcel taxes are regressive, unrelated to an ability to pay. So it’s ironic that both tax initiatives on the November ballot, which would raise money by raising the graduated income tax (Gov. Jerry Brown’s would also include a ¼ cent increase in the sales tax) are doing far worse than the parcel taxes and bond measures. Attorney Molly Munger’s Our Children, Our Future tax would send money directly to schools – essentially what parcel taxes do – though that feature is not widely known. Voters favor local control with their money, which appears to be why parcel taxes, for all their faults and limited geographical range, continue to do well. 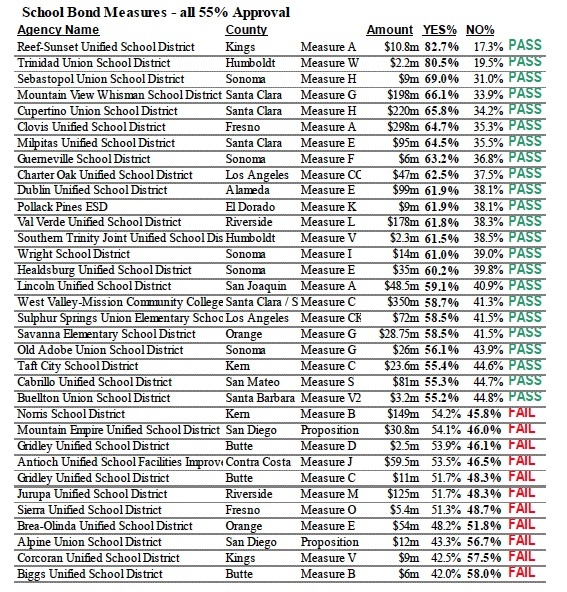 * Thanks to Mike McMahon, school consultant and trustee of the Alameda Unified School District, who tracks historic and current information on parcel taxes and other school data. “We are facing a nuclear winter for funding for public education,” said CSBA Vice President Josephine Lucey, a school board member from Cupertino. “Districts cannot absorb more cuts and provide a decent education.” Delegates decided it was smartest to back both initiatives, Lucey said, after concluding, “Why should we be fodder for a fight” between the two tax campaigns or the anti-tax Howard Jarvis Taxpayers Association, which would play up its opposition to one of the tax plans. Biehl, who plans to vote for both, said another factor was that the CSBA didn’t want to cut off dialogue with Brown, who has met with the board of directors and responded to their concerns, such as changing his plan for a weighted student formula. Both initiatives are expected to qualify for the ballot. Brown’s tax plan would raise between $6.5 billion and $9 billion by raising the sales tax ¼ percent for four years and the personal income tax between 1 and 3 percent for seven years on those earning more than $250,000. But most of the money would go toward shoring up the General Fund, with $2.9 billion going toward Proposition 98 next year; Brown would commit that to repay part of $9 billion in deferrals, late payments to school districts. Munger’s initiative would raise $5 billion in 2012-13 and then $10 billion for 11 years by raising the state’s progressive personal income tax less than a half-percent for lowest earners up to 2.2 percent for those earning more than $2.5 million. In the first three years, her plan would pay off $3 billion in state bonds, freeing up money for the General Fund, with the rest going toward K-12 schools and early childhood education. After that, all of the money would go directly to schools, on a per-student basis, and early childhood programs. If, against the odds, Munger’s initiative won and the governor’s lost, the Legislature could undermine it by separately manipulating the General Fund to decrease Proposition 98 funding for education. Brown and lawmakers have become adept at that. There would be disputes if both initiatives passed. The one with the highest vote total would determine which clauses applied in areas of overlap (the rates on the personal income tax); the courts would likely be called on to sort through other issues. In its press release on Sunday’s vote, CSBA made a strenuous case for more school funding while expressing little enthusiasm for Brown’s initiative. Quoting CSBA Executive Director Vernon Billy, it said, “CSBA opted for the dual endorsement because schools desperately need funding.” Yet, he and the CSBA leadership want to make it clear to the public that the governor’s initiative does not provide new funding for schools. Instead, it bolsters the General Fund with new revenue. “‘Under the governor’s plan, schools would get back some of the billions of dollars that were redirected away from them and used to shore up the state’s funding gap in the last budgetary cycle. The governor’s initiative only restores some of the funds already owed to schools,’” Billy said. The Legislative Analyst’s Office is suggesting an alternative to the massive cut to K-12 schools and community colleges that Gov. Jerry Brown is proposing if his tax initiative fails in November. Instead of a real spending cut of $2.8 billion, or $415 per K-12 student, districts and community colleges would be cut $1 billion, or only $162 per K-12 student, under the LAO plan. The LAO detailed its alternative in an analysis of Brown’s May budget revision, which the nonpartisan, independent agency released on Friday (see pages 21-22 in the pdf version). The difference is the size of the Proposition 98 spending obligation that is calculated for this year and next year, separate from the tax increase. The LAO assumes a more conservative approach, which would leave the K-12 schools and community colleges with $1.7 billion less than the governor has calculated and that districts will argue they are owed; that’s the downside for districts. The paradoxical upside is that, without a higher Proposition 98 base, they would feel less pain if the tax increase failed. Since most school districts are budgeting assuming the worst case, they could plan now for a smaller cut in the LAO proposal. Brown is also proposing a new, major manipulation of Proposition 98, with long-term implications to school funding, if the tax increase fails – a scheme that the LAO alternative would avoid. For districts, it comes down to which bitter pill to swallow. Proposition 98 was written so that schools receive significant increases when the economy is good and personal incomes throughout the state are rising. When the economy slows, IOUs to schools and community colleges accumulate; the sum is known as the maintenance factor, and, over the past four years, it’s become big – about $10 billion, or 20 percent of the Proposition 98 obligation (see this explanation). The $1.7 billion savings that the LAO envisions includes a $500 million maintenance factor repayment this year and $1.2 billion in 2012-13, under Brown’s budget. 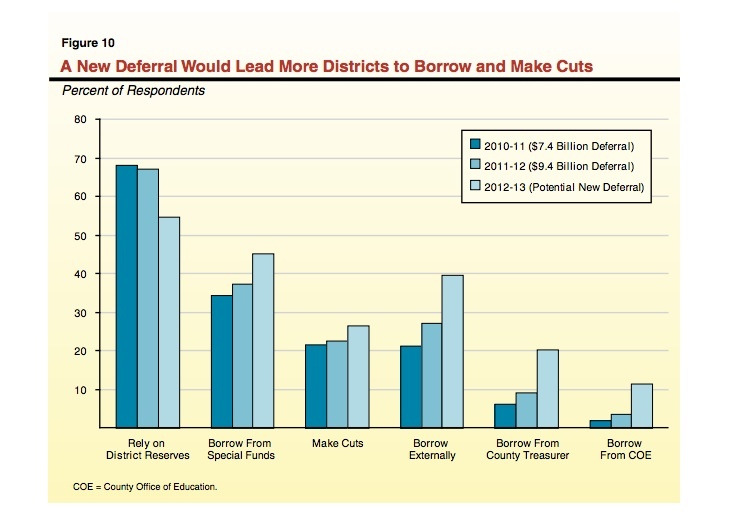 Brown is proposing to use a chunk of it to speed up repayment of deferrals, the chronically late state payments that have forced cash-strapped districts to borrow short-term money. Since Brown’s not proposing to increase programmatic spending for schools anyway, school operations won’t be affected next year by not receiving the maintenance factor, the LAO says. However, Brown and the Legislature will be able to spend the $1.7 billion on other areas of the state budget that are hurting. Now shift to November. Brown is proposing to raise the sales tax 1/4 percentage point and the income tax on the wealthy between 1 and 3 percentage points, and he has built his budget assuming the increase would pass. If it fails, he would cut K-12 schools and community colleges $5.5 billion: 90 percent of the total $6.1 billion cut. 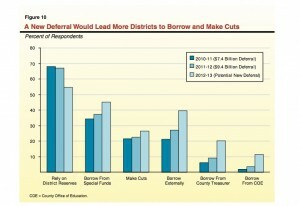 About half of the $5.5 billion cut would be the postponement of repaying deferrals. The LAO and Brown agree this would be necessary. But Brown would then cut $2.8 billion in real dollars to schools by further manipulating the Prop 98 formula. He would shift $2.8 billion of expenses that had been funded outside of Prop 98 into it, forcing a corresponding cut to per-student funding. The two expenses are repayment of state bonds for school construction ($2.6 billion) and the Early Start early education program ($238 million). All of this is dense stuff that is nearly indecipherable. 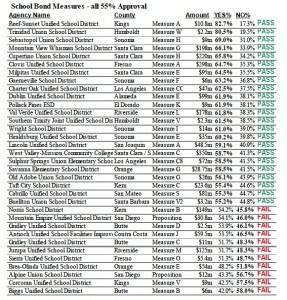 It offers further evidence for the failure of how California finances state government and schools in particular. 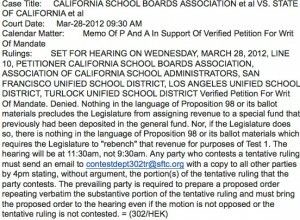 But which method of calculating Prop 98 has consequences? On the one hand, it will determine whether districts get $1.7 billion owed them next year or later; on the other, it will determine whether, failing passage of a tax increase, schools face a cut of $415 or $162 per student; the $253 difference is equal to almost two weeks of school.